Our outdoor classroom is one big slope and within that slope there are many ups and downs, reflecting our city which iss built on hills. We're forever experimenting with gravity out there, rolling and flowing things downhill or dragging and pushing things up. There are parts of the space that are so steep one needs a running start to get to the top and there is very little flat upon which to rest one's legs. We have a pair of wagons, which are regularly used on the hills. Last week, one became an airplane. From my photos, it's easy to see the physics and engineering learning, but in many ways those were minor aspects, almost side-effects, of the bigger, more important project, which was figuring out how to get along with the other people. People sometimes question the "rigor" of a play-based curriculum when, in fact, we're engaged in the most rigorous curriculum known to mankind. There is simply no greater or more important challenge than the one of balancing our own individual desires and needs with those of the other humans with whom we find ourselves. 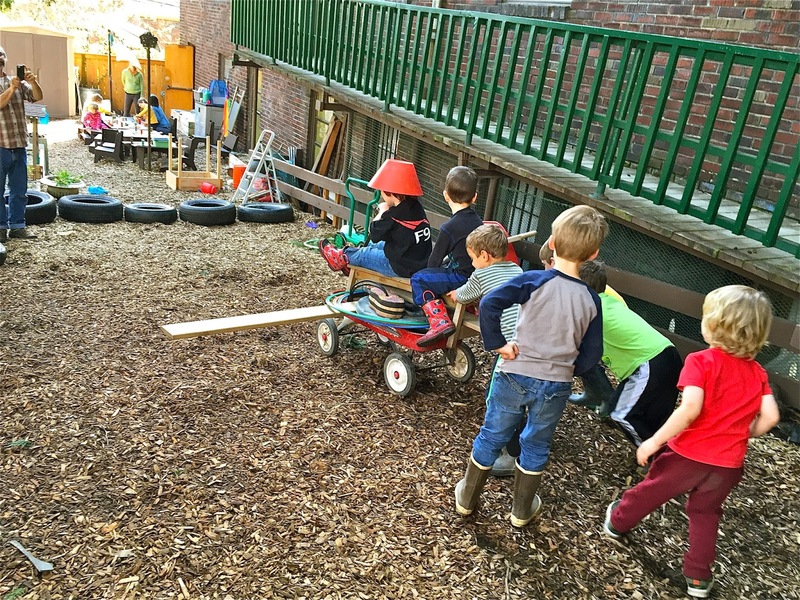 A play-based curriculum is rigorous because of it's subject matter, which is the all-important one of getting along with the one another, something children are passionate about. Traditional schools, on the other hand, are rigorous simply because they attempt to teach less interesting things by rote, lecture, and text book, the most difficult way to learn new things because most children find them tedious and frustrating. It's an artificial rigor designed, I guess, to make the adults feel important. 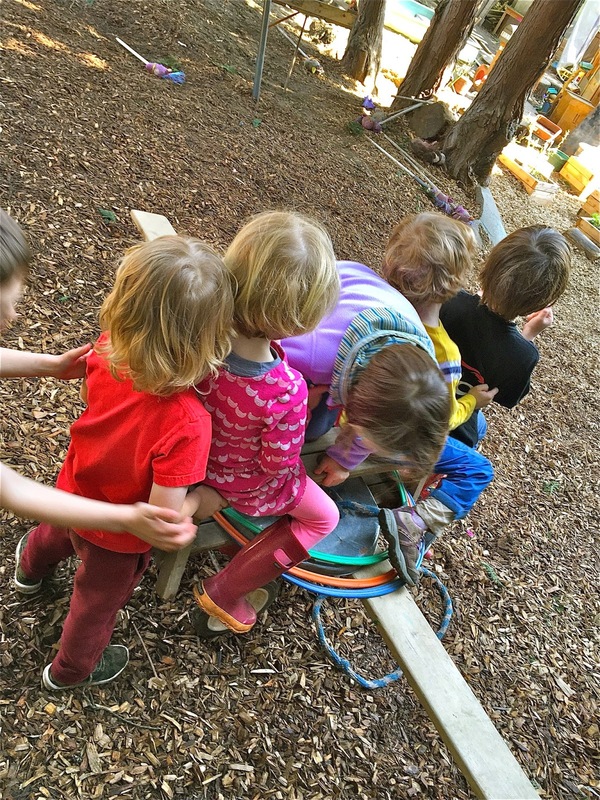 Many people confuse hating school with rigor, saying things like, "It prepares them for life," but those of us who work in a play-based environment spend our days amongst children who love school, who arrive each day eager to tackle the challenges of community, and I would assert that there is no better preparation for life. Make no mistake, it's not pure joy, it's not all laughter. There are tears. There is conflict. There is negotiating and compromise. Children might complain, but they return each day eager to engage, to figure out the things they are most driven to figure out: the most important things of all. There was so much to learn about flying our airplane together. Would it be safe? Where would everyone sit? How many of us can go at a time? Who gets to steer? Who rides and who "launches?" How do we get it back to the top of the hill? How do we make sure everyone gets a turn? For the most part, we adults stood back, taking a few pictures, letting the kids work it out. Sure, the first few times they launched themselves down the hill, I jogged just ahead of them, prepared to intervene in the name of safety, but as it turned out on this day, I was unnecessary, even when the airplane crashed and burned. I'll take the real rigor of play over the artificial rigor of rote any day. And so would the kids. "What A Healthy Thing That Is!" Good News! Good On Us!